The Institute is also recognized as one of the centers in the country for PhD Programs under QIP. Facilities for enrolling for the PhD Program as a part time candidate are also available. Applicants for admission to the Ph.D. programme shall be classified under any one of the following categories which will be decided and recommended by DRC/CRC. 1. Master’s degree with minimum Cumulative Grade Point Average (CGPA) of 6.0 on a 10 point scale, or 60% marks for the General and OBC category. However, candidates with M.Sc / M.A / M. Com must, in addition, have either a valid GATE score or must have qualified JRF / NET. For SC / ST or PwD candidates the minimum CGPA requirements may be relaxed to 5.50 on a 10 point scale or to 55% marks. 2. For candidates other than Centrally Funded Technical Institutes (CFTIs), B.Tech / B.Arch / B.Pharm degree or equivalent with a valid GATE / GPAT score and a minimum CGPA of 7.50 on a 10 point scale or 75% marks, irrespective of the category. For graduates from CFTIs, the minimum CGPA requirement is relaxed to 7.0 on a 10 point scale or 70% marks. 3. CGPA or percentage of marks in aggregate, in case marks are awarded, of all years /semesters will be considered. If the CGPA is awarded on a scale other than a 10 point scale, proportionate concession to a 10 point scale will be considered. 4. The requirement of a valid GATE / GPAT / JRF / NET score is not applicable to candidates in ISERS or P-ISIRS or P-ISERS category. 5. Bachelors and Masters from IITs with a CGPA 8.0 and above on 10 scale point scale are exempt from the requirement of GATE / GPAT / JRF /NET. 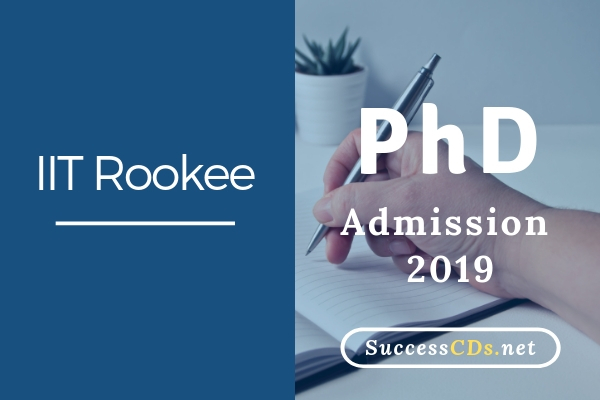 IIT Roorkee have CGPA 8.50 and above, shall have a choice of lateral entry to the Ph.D. program after completing first two semesters of the Master’s program. 7. GATE / GPAT / JRF / NET, if applicable, shall be valid at the time of registration. 8. Candidates with MBBS / BDS degree from an Indian Universities / Institution shall have minimum CGPA of 6.0 on a 10 point scale, or 60% in the qualifying degree, irrespective of the category. They are exempt from the GATE / GPAT / JRF / NET requirement. 9. Candidates with Master of Surgery (MS)/ Doctor of Medicine (MD) degree from a Indian University / Institute are exempt from the minimum CGPA as well as the GATE / GPAT / JRF / NET requirement. 10. Candidates with a medicine degree from an overseas university / institute should have qualified the Foreign Medical Graduate Examination conducted by the National Board of Examination. 11. Candidates with Overseas Citizen of India (OCI) / Person of Indian Origin (PIO) status will be treated at par with Indian Nationals in the General Category. 1. Application Fee per department (non-refundable): Rs. 200/- for General/Economically Weaker Sections (EWS)/OBC category and Rs. 100/- for SC/ST/PD category candidate. The candidates can deposit the requisite application fee by using net banking or debit/credit card facilities. Additional charges will be applicable as per the rule of the concerned bank. The Fee will not be accepted through any other mode. 2. If candidate opts for more than one department/centre, then application fee should be paid in accordance to the number of department/centre. For admission to Ph.D. programmes for Autumn Semester of the session 2019-20 candidates need to register and fill the application ONLINE only from March 05, 2019 by accessing the website www.iitr.ac.in on or before March 25, 2019 (5:00 p.m.). Candidates must follow the following Steps while filling online Application Form. d) Upload documents as mentioned above. Candidates can download Application form for their own record.